In a new year, I’m thankful for the same old mercies. Because while looking ahead at all the blank dates that are beginning to fill with practices and programs and work to-dos, I also begin to wonder what heartache may be lurking too. It often feels like we are supposed to think that in a new year it’s time for the questions of the past to be stuffed away and sealed shut while we don our new outfits and brighten our faces toward what this year has to offer. It’s not that easy, is it? New doesn’t mean perfect. New doesn’t mean tidy. New doesn’t even always mean new. Have you ever bought a used car that was new to you? What about moving into that coveted “new” home that’s rich with character from the years it’s seen before you ever laid eyes on it. And as good as new sounds, it isn’t always comfortable. New doesn’t mean that the old is zipped neatly away so that something better can replace it. New often means rebirth, relearning, reshaping in the middle of the same old hard things. Because for us, as flesh, we are constantly withering away. We are “like grass” and “the grass withers and the flowers fall” (1 Peter 2:24). So how can we find newness in the middle of wilting petals and tired leaves that look like gray hairs sneaking in and baggy morning eyes unconcealed? Can there be newness in the rut of breakfast bowl bickering and a sick child’s syringes? New is a state of the heart. 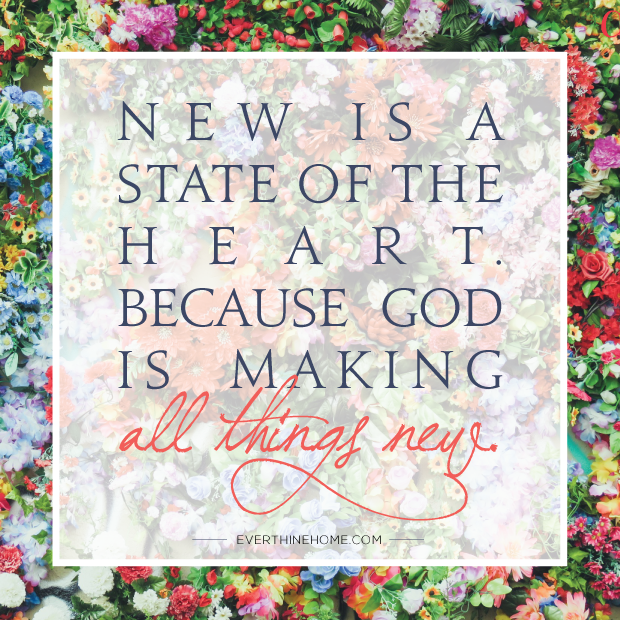 Because God is making all things new. And even though it’s sometimes hard to see what little newness ebbs in inch by painful inch, we can hang on while He whittles away at our hearts. While He wrestles with our children. While He holds us close in our suffering yet leaves lingering questions unanswered. Because new looks like His mercies that are fresh sunrise by sweet sunrise, day by ‘nother day, moment by messy moment. “The steadfast love of the Lord never ceases; his mercies never come to an end; they are new every morning; great is your faithfulness” (Lamentations 3:22-23). That same old faithfulness is something to never grow tired of as He lovingly makes each of us new. To see learn more about God’s faithfulness in Annie’s story, follow her journey at heartforannie.wordpress.com. You should get in touch with my friend Maribeth Gillis Poole. She is a 30 year old young woman who was born with hypoplastic left heart syndrome. She is now a teacher, married and has a blog which ministry to families of children with heart conditions. You can find her blog at http://maribethgillis.blogspot.com/ I can connect you if you’d like. ← What makes you remember?